Welcome to SAU Community, like most online communities you must register to view or post in our community, but don't worry this is a simple free process that requires minimal information for you to signup. Be apart of SAU Community by signing in or creating an account. Hi folks this is my first trip through an R32/ RB25 gtr transmission. I see much discussion about push and pull style clutch fork and slave arrangements. What follows are some pictures that show the slave and fork arrangement. This is a '93 J spec car as I understand it. Can someone confirm that this is the late style transmission with "pull" clutch fork action? I am looking for a supplier of a bearing kit. CBC say they have them for R32 with RB20 and the R33. Can I assume the kit for the R33 will suit? I look forward to your observations and comments. RB20 <> RB26. There is only push clutches on RB20 and RB25, except that the RB25 Neo went to a pull clutch. Early RB26s were push. Later ones were pull. Your post is confusing because you mention R32 / RB25 gearbox in the thread title, then you say RB25 GTR in the actual post. There is no such thing as an RB25 GTR gearbox. Are you talking about a RWD gearbox, or a 4WD gearbox? If RWD, are you talking about the original box from the R32 (which would all be the small body, regardless of NA RB20, turbo RB20 or NA RB25) or are you talking about the RB25 gearbox from an R33 (which is the same type of clutch as the R32 stuff anyway) or a RWD gearbox from an R34 (which, as I said above, is a pull type). Or, if AWD, are you talking about the box from behind an R32 RB20DET from a GTS4, or are you talking about the box from behind an RB25DE (NON TURBO) from an R33 GTS4, or are you talking about the box from behind an RB25DET from a Stagea. Notwithstanding the lack of clarity in your question leading to all the above possible answers, all of this is extremely well documented on this and a billion other sites. I can surely say your pics are a pull clutch if that helps! GTSBoy, Thanks for taking the time to reply. The car is a '93 GTR 4WD.Has the bigger engine it is 2.5 or 2.6 litre. As Duncan said, your pictures are of a pull clutch. The later R32 GTR RB26 clutches have nothing in common with the RB20 clutches. Make sure that you don't confuse CBC (or any other clutch supplier) by mentioning RB20s. Only talk about "pull type RB26" clutches. GTSBoy, Now that you and Duncan have confirmed this is a later pull style clutch. What I am proposing to do is to dismantle the gearbox and fit a new bearing kit. This is where CBC enter the picture as a possible supplier. Are there other suppliers of bearing kits for these gearboxes? I really should read your post more thoroughly! I thought you were looking for a clutch and thought CBC was an odd choice, but was willing to run with it if they said they could supply what you were after. CBC is probably a fair choice for getting bearings. All the other major bearing suppliers are probably equivalent. You can also source the bearings (singly, rather than as a kit) from Nissan, or other sources of Nissan spares (like Amayama, RHDJapan, etc). You could also talk to gearbox/diff workshops about buying through them, although it would probably cost more. 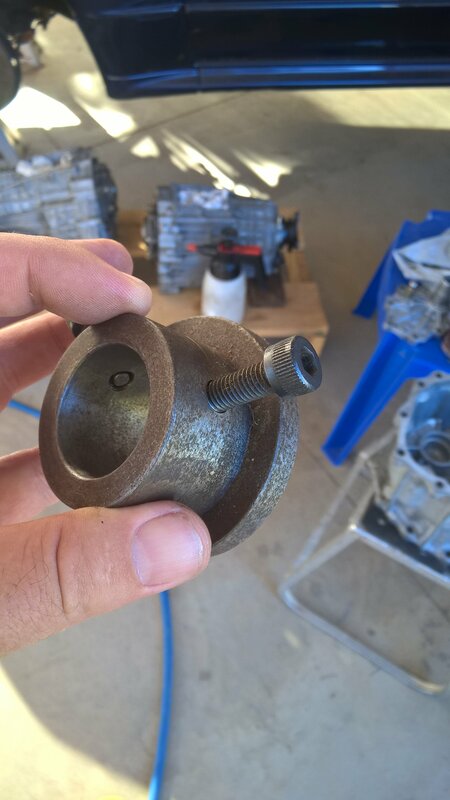 They, at least, upon sighting your gearbox, would be more likely to source the correct bits. Now, here's an important point. I'm not sure whether there are any significant differences between the push and pull type GTR gearboxes for any of the bearings. 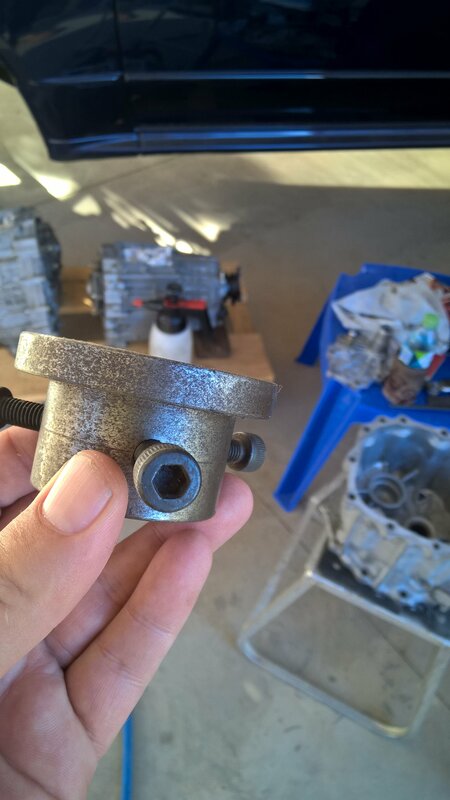 The thrust bearing for the clutch itself is, of course, totally different. But everything behind that could be exactly the same. Of course, the early push type ones probably saw some upgrades in the "model change" that lead to the pull type, so there are probably differences in bearings between them, along with synchro spec differences and all sort of other possibilities. If you get and install Nissan FAST, and put the VIN into it, you will find listings of all the part numbers for your car. If the gearbox is the original one, it should be accurate. Alternatively, you could post your VIN in here or in the dedicated thread and ask for someone else to FAST it for you. Beware though, it is very generous of people to do it for you, because it can be quite time consuming for a large number of parts like this. In addition to GTSBoy's advice, there were running changes during the r33 gearboxes (and your late 32) so you will need to be careful as some parts are replacements and some are different. eg, I know there is some difference in the strength of the selector clips in the series 3 (last) R33 boxes. Unfortunately the best gearbox shop for skylines appears to be gone, and I haven't had to find another place since. For what it's worth, as well as bearings, you are likely to need new synchros by now, and there were also changes in those over the years. I don't know enough to give specific advice. No change between bearings from 89 - 98 (All GTR 5 speed FS5W30A and Z32 and R33 GTS-25t) regardless of push or pull. No difference in box internals until 97 series 3 R33 where synchro baulk rings, shift spring insert and selector fork changes happened on 2nd, 3rd and 4th gear (ie. the changes you need to do to run a current OS giken gearset in an older box). In other words no difference in bearings across all 5 speed GTR. DO NOT get RB20 set, different. BK the essential purpose in going through the box is that the synchros are becoming slow and the gears crunch from time to time. That being the case then whilst it is apart a new bearing kit seems to me a good idea. Ok so your pulling the box down to do synchro repairs. Fair enough replace them then while it's apart. Sounded like you wanted to pull the box down just for bearings as you didn't mention synchro problems. If it crunches intermittently yeah there worn or you've got wrong oil. Remember GL-4 in these brass synchro boxes, GL-5 creates shift problems. yeah that's why I mentioned the synchros. the bearings in these boxes are generally pretty good with only front input shaft bearing sometimes needing replacement. 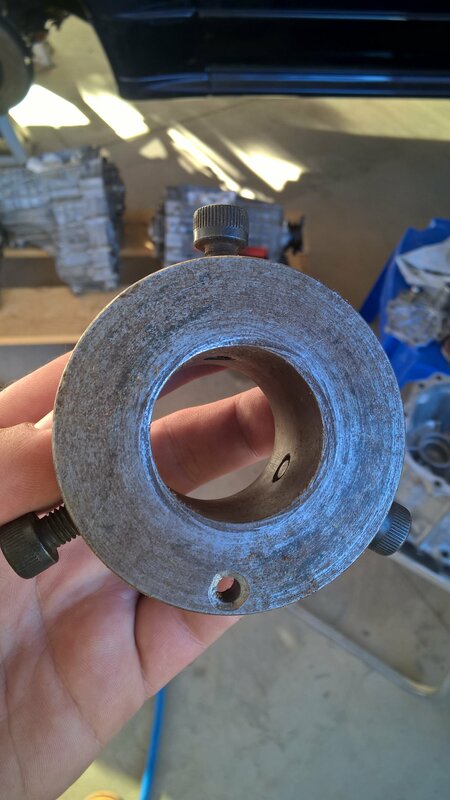 Once you strip it down you will probably find the bearings are OK to reuse, and expensive and hard to find if you want to do it for preventative maintenance. I have progressed quite some way in dismantling this gearbox. I have now hit a stumbling block. The pictures attached show the rear portion of counter gear as it protrudes through the sandwich plate. You can see the 3 holes which I understand enables a special tool to be attached to the sleeve and then pull it off will a puller. I made up sleeve which you can see in the second picture however on attaching it with three stepped bolts I made to screw into the three holes all bolts sheered the tips off. It is clear this sleeve is very tight. I do not want to apply any heat to it. Any tips or other advice here would be appreciated. As a last resort is the factory tool readily available? The diagram of it in the manual is not clear as to how it works. It appears to be more than a simple sleeve with 3 pins spaced at 120 deg. Anyone have one of these that they can post a picture of ? This is what we got made up from a machinist to get that sleeve off. Basically the same idea as the factory tool to allow a puller something to grab. BK, What you have is basically the same idea that I have utilized although I think yours is a bit more robust than mine. That said anything home made like this is still restricted by the size of the holes in the sleeve. They are only 5mm dia. and as your attachment illustrates the screws need to be turned down to fit the holes. As mentioned above my screws sheared off at the step down to the 5mm tips. 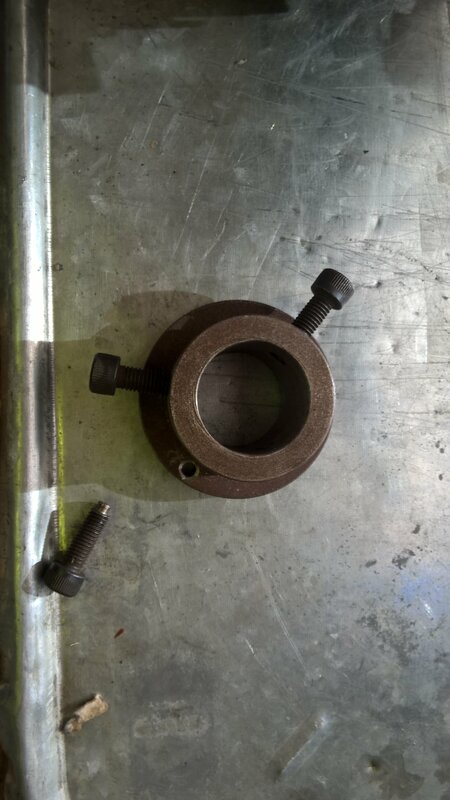 High tensile bolts, not Bunnings bolts. Yep that's it, high tensile with 5mn steps on the end. Not home made, was made by a machining shop here with our supplied dimensions. Cost about $100. By the look of your sleeve you have no edge, so I assume you were trying to pull on the bolts directly, which won't work. Need a thick sleeve so there is a decent thread contact area on the sleeve puller. You need something like what I've showed you, never had an issue with this setup using it on multiple gearboxes. BK the sleeve is about 6 mm thick and that allowed my puller to attach on the edge , not on the bolts. However observing the unit you had made up I think I will make a more robust version like yours with larger bolts and give it another go. I don't want to start using heat/welder as in the story in that link I posted. yeah large pulling edge so you can get a decent puller that won't slip off the pulling edge and really get some torque into it. Well after having the new bearing sleeve attachment made up , by my big brother who is a handy machinist these days( see pics) ,I fitted it up and was able to remove the sleeve first attempt without any further drama. All good! Now, the next issue is the rear thrust race on the counter gear . The manual shows a bearing plate attached and pressing the thrust race off together with the bearing sleeve. I am concerned that as the bearing plate captures only the outer edge of the thrust race that loading it up with a puller/press is going to distort/destroy it . What's the go here? See last pic. Next question. 5th gear synchromesh workings. I see there are two syncho cones associated with 5th gear. However on looking closely at them it appears that one cone operates when you engage 5th and the other appears to operate when you pull it out of 5th. Can any one explain the theory or workings of the 5th gear synchro arrangement? DON'T BE SCAMMED! READ BEFORE YOU TRADE! aus Mineral water Bottling Plant Manufacturer.